I have written in most of my articles and posts that everything nowadays is anchored on politics. Sport, religion, culture or anything to do with social development programs is politically influenced. This for me has a lot of issues attributed to it. Good and bad alike, the question is what can we learn from this? That is if we can. You will agree with me that sports disciplines like football are now run by people who are influenced by politics. In my opinion it is an animal farm affair. Look at how FIFA works and how they run their rankings. Purely political. Having said that. I want to talk about the Nigeria -Zambia game. Before, during and after the game and where we go from here. First things first. I am really sure that Mr Andrew Kamanga and his team at Football Association of Zambia are working very hard to improve the game of football in our nation. That’s why in their first term in office they have brought or rather helped us win the U20 COSAFA Cup, U20 African Cup of Nations and qualifications to the CHAN Championship among other achievements. This is good work. But we have achieved most of those things with previous administrators. People wanted a World Cup qualification. For me that was a standard l put for Kamanga. Hence regardless of what happened and what did not. FAZ and the technical bench have failed us. Too much politicking, pride and arrogance has failed us. The game against Nigeria was a game changer where qualification for Russia was concerned. In my opinion the exclusion of senior players was a very big mistake by coach Wada Nyirenda. Big boys know how to handle big games like the one we had with the Super Eagles. Experience counts. Kalaba, Tembo, Mbesuma, Kalengo among others would have used their experience to deal with the likes of Moses. Even that goal we are crying about. They would have known how to respond. Our young stars played standard football not one that would show a team going for a win. The likes of Fashion and Mwepu are good yes. But let’s face it they are still infants at senior level. So whatever beef happened between Wada or FAZ and people like Rainford and Winston was handled with immaturity by those in power. Football politics at play. I am a Liverpool supporter and my team is very bad at the back because of one thing. The defense which was getting strong because of the help of Mamadu Sakho. But because of the misunderstanding during pre season training between Liverpool manager Klopp and Sakho. Our defense is like a big net with holes. Mamadu was cast out through a loan and later a sell. Pride and arrogance at play. I am sure the Liverpool backroom stuff is regretting like Wada and FAZ is. To much politicking and pride. And talking about politics what the hell in the world of football was that big banner of President Lungu doing in Nigeria. We all love our President but that banner was misplaced. 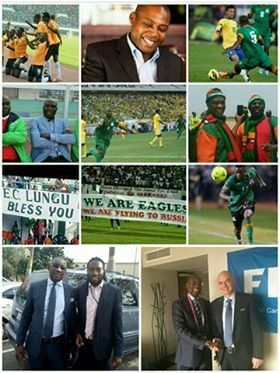 The Zambia National Team that went to West Africa belongs to all Zambians not only President Lungu. As l said we love our President but as a player that is the last thing l would think about. I expected to see a banner of solidarity for Kalaba and Kalengo. Even one with the name and face of Kalusha Bwalya would have scared the hell out of some of those Nigerian players. Not that of ba Lungu. That too might have cost us the game. Maybe l didn’t vote for President Lungu then l see that banner as a player. I can be like really!!! I know I said everything is anchored on politics but some things are just a distraction. And that banner was. Look at our friend’s banner. No Cadralism. My advice to everyone involved let us all focus on blending the team. Old and new alike. Those with ideas let’s engage those in power. Those in power let’s be approachable. And more importantly let’s leave cadre centered supporting out of football. Mr Kamanga as l said I will be visiting you soon. Author is a PhD candidate in Political, Gender and Transnational Studies at Goethe University Frankfurt am. PhD candidate Mr Kaluba (if I may call you that before you become Dr), you have missed the real issue. The issue here is that Zambia is being governed by a corrupt government that inspires nobody even themselves. The thieving trait runs in their DNA through and through. Here is my point, the Zambian government and FAZ for that, clearly know the rules that govern FIFA matches. That’s, no displays of political or religious banners or slogans at any FIFA or CAF associated games. Because PF, a bunch of thieves decided to smuggle the Lungu banner into the stadium to the dismay of 200 million Nigerians. Supper Sport had to apologize to the shocked football world for inadvertently showing the rubbish of the Zambian delegation. I was watching the game with a group of Nigerians, and when the banners was flashed on the screen, these guys asked whether Lungu wants to run as the next Nigerian president. What a regime we have. Stealing everything including the moral compass of what the great Pele called the beautiful game. I don’t know where this author was watching the game from.I totally disagree with you,kalaba is a very very finished player you cant compare him to any player who played on sartuday, maybe chisamba lungu whom I feel shud also be weeded out of the team.The team played better than if kalaba was in that team.infact if kalaba played in that team we would have lost by a bigger margin.but if you look at the way mwepu and all others were playing they were covering each other very well.the problem with Zambians is that we like condemning even where it is not necessary.Yes it is painful to say we lost but we still shud take pride even when we lose not ukuleta amashina yamakula.